« All’s Well that Pays Well? 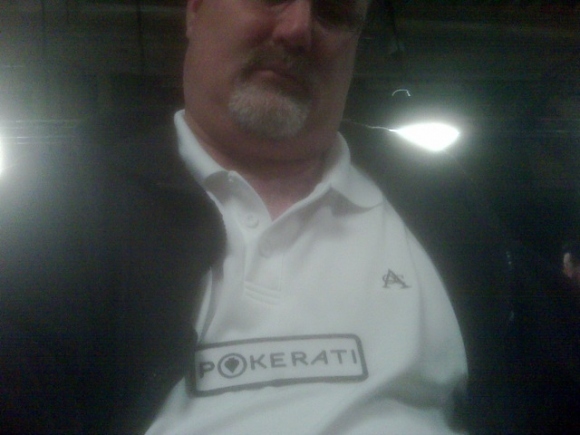 Usually, at least among bracelet holders and Batfaces at the WSOP, Team Pokerati members are not required to wear their patchwork until after electronic devices have to come off the tables. This was a compromise reached with the TPPU (Team Pokerati Players Union) because we see lots of people we know and like throughout the early stages of tournaments, and unless they’re some sort of ridiculous super-monster chip leader, we usually say the same thing when they say hi: Whatever, talk to us on Day 2. Well, for the first time this Series, our mascot pal Tom actually has something to say … because for the first time this WSOP, @DonkeyBomber has “bagged chips” — and sure enough, he credits his early donning of The Patch, if not our friendly encouragement and mixed games coaching, for this baby step toward success. Tom is playing in the $10k 7CS-HL, and with 110 of 164 players remaining, he’ll begin Day 2 near the top of the leaderboard, 8th in chips. Congrats, Schneider. Hopefully yesterday will not be remembered as your best day of the 2009 WSOP! Remember, Tom won a bracelet in this event in 2007, taking $147k on a 1k buy-in. A win this year would bring $437k. Go Tom! Just kidding ya Tom. I remember seeing you on WPT once.